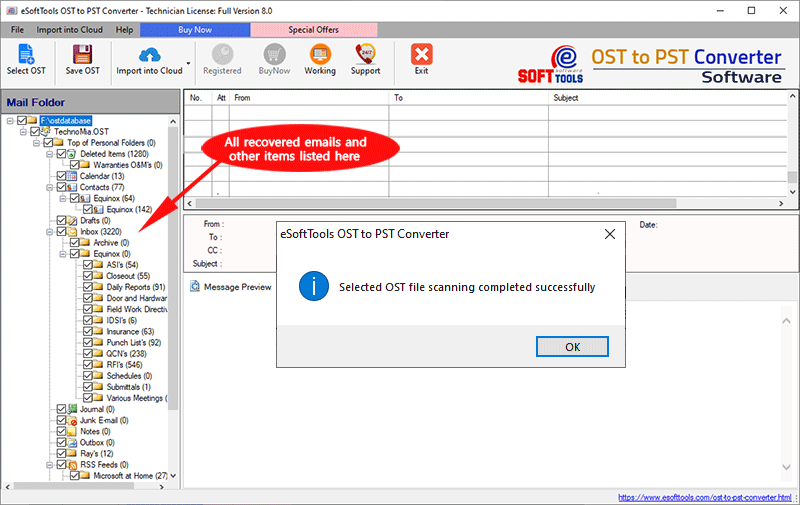 eSoftTools OST to PST Converter software presents automated and safe OST file recovery & OST Export technology to easily recover corrupted, inaccessible & orphaned OST file items such as OST emails, contacts, calendar, tasks, journals etc. and offers to export OST to PST, Office365, MBOX, EML, MSG and many other formats without modifying item properties. Download OST to PST Converter Tool freely & instantly to recover OST file, export & convert OST to PST file with all items of OST file. During and after OST conversion, the software keep maintains original folder structure. Complete suite to convert ost to pst file with all types of OST folders included inbox, contacts, calendar, notes, tasks, journal folders. Demo version ost to pst software recover ost file and save 25 items from every folders. Looking for best OST file recovery software to fight & recover orphaned OST file and to make conversion into valuable Outlook PST file? Now eSoftTools OST file recovery tool is most suitable software for your need to recover corrupted, damaged and orphaned OST file items to most popular file formats. This software offers to open and recover ost file from upto OST 2019. eSoftTools OST to PST Converter software inbuilt multiple conversion options to export & convert OST to PST, Office365, MBOX, EML, MSG, EMLX, HTML, vCard and many other formats. Click to know how to Convert OST to PST file? In the OST to PST converter Software, the best feature "Convert Selective Folders" is added for users to export selected OST folders and sub-folders to save time. Easy process of OST file recovery tool makes very smoother process to convert OST to PST file completely without changing or altering internal properties of any items. 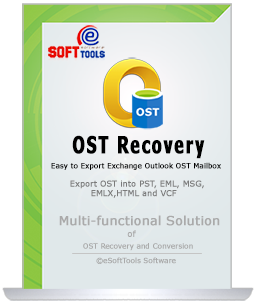 This software for OST recovery completely supports all Outlook & Windows operating systems. This software is covered with versatile features and Split PST file during OST export is one of them. This option is on user's choice if they want to split PST file and creates smaller files as per requirement. 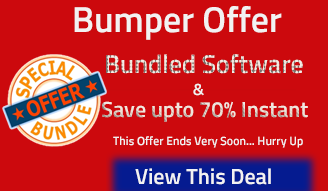 Software offers to split pst file into 1gb, 2gb, 3gb, 4gb, 5gb and 10gb of size. Everyone maintains emails in sequential folder hierarchy and wants to keep maintain these structures to track every record of emails and other items. Our OST to PST Converter tool works on exactly and preserve the same folder hierarchy as they are in OST file. This software keep maintains every OST items properties and meta-data. Updated version of export OST to PST software has powerful and smart file preview techniques to load every items preview clearly and displays whole emails, contacts, calendar, notes, journal & tasks items preview. Migration from Outlook OST to Office365 is available on updated software. Users can easy to handle and Convert OST to Office365 cloud without needing any third-party application and successfully convert OST emails, contacts, calendar and all items into Office365 cloud. The enhanced feature of OST to PST Converter Software comes with OST to MBOX Conversion as per our user's demand. This features is available on every license of OST recovery tool which help users to easily convert OST to MBOX file. The converted MBOX files can easily import by Thunderbird, Netscape, Spicebird, Seamonkey and all other mbox supported email clients. 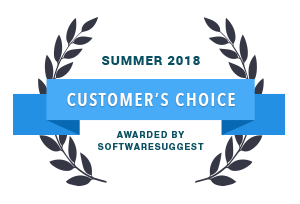 The software adds flexibility to the user while saving OST file to filter emails according to date and filter emails in between date range and export only required emails from OST to PST file. 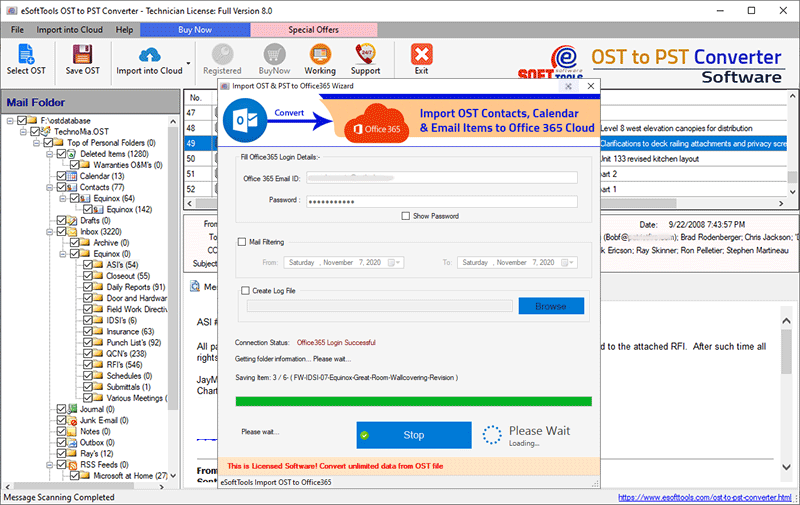 If your concern is to export OST contacts, then this software is most helpful for you because this OST to PST export software has separate feature to export OST contacts to vCard (vcf) file. eSoftTools OST to PST Converter software do not requires MS Outlook to operate and convert OST file. Without MS Outlook, this software flawless work on corrupted, damaged and orphaned OST files and easy to convert ost to pst file. The software fully supported on latest version of MS Outlook and Windows operating systems. The only limitation in trail version software is to save 50 items from OST folder and sub-folders into every conversion format. Trail version limitations auto removed once you applied the valid license and save unlimited data from ost to pst file. 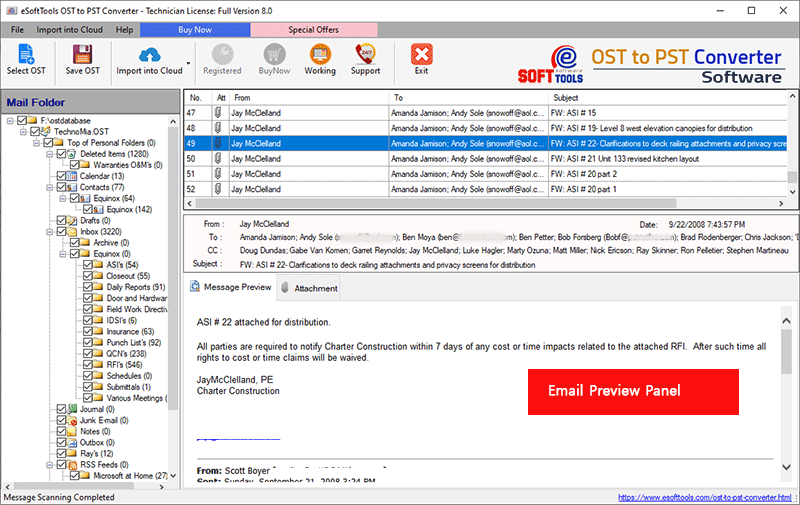 NO MS Outlook installation required for OST file coversion. See step by step OST conversion process with just follow by simple steps and get complete access of eSoftTools OST to PST converter Software. Can I recover only essential emails from offline OST file using software? 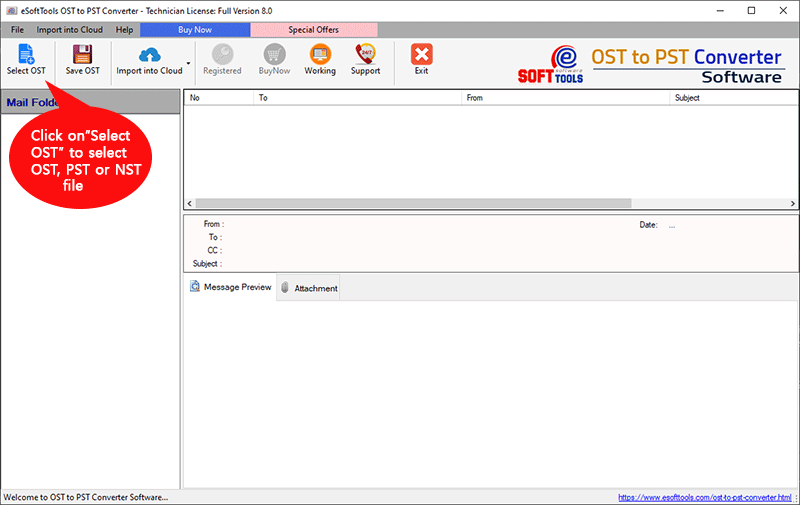 Yes, the OST to PST Converter software allows convert only essential emails from OST file, make selection of emails with attachments and convert them into new created PST file. Do I need to install MS Outlook or exchange Server for OST to PST conversion? Will Software extract attachments items of OST files to PST Outlook file? How much time does software take to convert outlook OST to PST file? The time mandatory by the OST to PST Converter software to perform OST to PST conversion heavily depends on the size of your OST file. In which OST converter to PST Software can I convert OST file? You can convert outlook OST to PST, EML, MSG, HTML, EMLX and vCard format. OST to PST Converter is outstanding, particularly if your OST file is enormous. This OST Converter to PST tool is tranquil to usage and assistances me to recover from corrupt and damaged OST file. This is one of the improved software for converting OST to PST. Overall, the transformation procedure is fairly straightforward, and you get file converted in few minutes. Thanks, eSoftTools for reviving me with the problem of Exchange OST files. I get my all inaccessible emails in the healthy format which I easy to read in PST Outlook format and also I convert OST emails to other formats. Thanks again!